Ten years after releasing the first edition of Practical Packet Analysis, the third edition is finished and has been released! It’s hard to believe it’s been so long. So far, existing editions have sold tens of thousands of copies, been translated into multiple languages, and been used as a textbook in multiple college courses. I’m very humbled by the success the book has seen over the past decade. the key word I want to focus on is Practical. There are a lot of books about networking and protocols out there that get into the specific details at magnified level, but this isn’t that book. This book is written for people who need to do things like solve network issues, troubleshoot latency, or investigate security threats. Capturing packets is easy, but understanding them isn’t, and PPA is designed to give you the practical knowledge you need to get started down the right path. 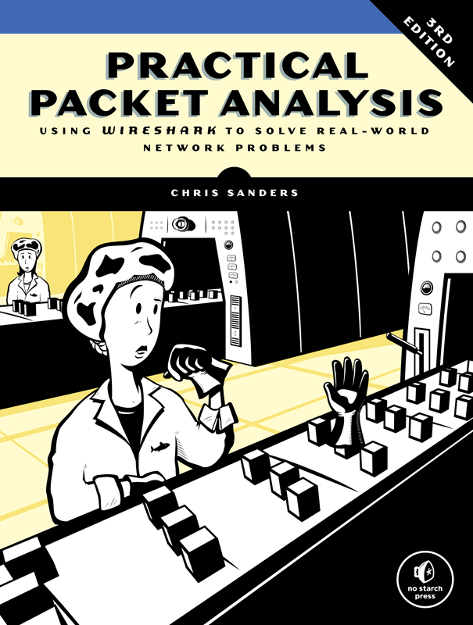 Practical Packet Analysis was the first book of its kind a decade ago, and the approach I’ve taken is unlike any other book you’ll find on the topic. Updated content for Wireshark 2. A new chapter on packet analysis from the command line with tshark and tcpdump. A bonus chapter on how to read packets in hex using packet diagrams. New protocol coverage of IPv6 and SMTP. All new scenarios related to network troubleshooting, internet of things devices, and security scenarios. A significant portion of the royalties from Practical Packet Analysis will be going to support a number of charities. This includes the Rural Technology Fund, the Against Malaria Foundation, and several others. Through your purchase of my books we’ve been able to put computer science resources into the hands of over 10,000 students just last year alone, purchase life saving mosquito nets for thousands of African families, and so much more. I’m thrilled to be able to use my work to serve others, and I hope you’ll share in that joy with me. First of all, I want to sincerely thank everyone who has ever purchased any of the prior editions. I know you work hard for your money, so I’m glad my work was deemed worthy of your contribution and your time. As I always do, I want to share the acknowledgements and dedications you’ll find in the first few pages. I’d like to express sincere gratitude for the people who’ve supported me and the development of this book. Ellen, thank you for your unconditional love and for putting up with me pecking away at the keyboard in bed for countless nights while you were trying to sleep. Mom, even in death the example of kindness you set continues to motivate me. Dad, I learned what hard work was from you and none of this happens without that. Jason Smith, you’re like a brother to me, and I can’t thank you enough for being a constant sounding board. Regarding my coworkers past and present, I’m very fortunate to have surrounded myself with people who’ve made me a smarter, better person. There’s no way I can name everyone, but I want to sincerely thank Dustin, Alek, Martin, Patrick, Chris, Mike, and Grady for supporting me every day and embracing what it means to be servant leaders. Thanks to Tyler Reguly who served as the primary technical editor. I make stupid mistakes sometimes, and you make me look less stupid. Also, thanks to David Vaughan for providing an extra set of eyes, Jeff Carrell for helping edit the IPv6 content, Brad Duncan for providing a capture file used in the security chapter, and the team at QA Café for providing a Cloudshark license that I used to organize the packet captures for the book. Of course, I also have to extend thanks to Gerald Combs and the Wireshark development team. It’s the dedication of Gerald and hundreds of other developers that makes Wireshark such a great analysis platform. If it weren’t for their efforts, information technology and network security would be significantly worse off. Finally, thanks to Bill, Serena, Anna, Jan, Amanda, Alison, and the rest of the No Starch Press staff for their diligence in editing and producing all three editions of Practical Packet Analysis. This time around, rather that dedicating the book to an individual, I chose to include the first verse of one of my favorite songs, “Amazing Grace”. These words have profound meaning, and they just felt right positioned as the first words you’ll read in these pages. Finally, if you do end up with a copy of Practical Packet Analysis, I’m always grateful for a review on the books Amazon page. A positive review is the most meaningful way to help an author whose work you enjoyed. If you’d rather share your review with me directly, don’t hesitate to e-mail me. I’m always happy to hear your feedback.